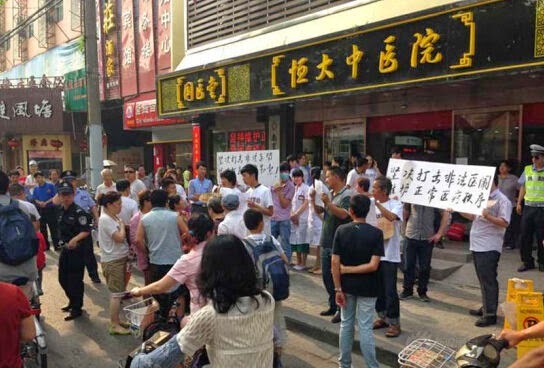 Two very interesting and very different articles this week on violence against doctors in China: one in the New Yorker and another in the form of a study in the BMJ Open. The New Yorker story is in the usual stylish narrative, but I prefer the BMJ Open article, because it has more facts and more insights, even if it is a dry scientific paper. In the New Yorker, writer Chris Beam uses the example of the murder of a doctor in Harbin to shine some light on the whole fraught situation of violence against doctors in China. The story focuses on the case of a young man from a small town who had debilitating and degenerative back pain (ankylosing spondylitis) and who was unable to get satisfactory treatment from a Harbin hospital. He also had TB, which made treatment with an immunosuppressive drug even more difficult. Frustrated at his patchy and expensive treatment, the young man returned to the hospital and attacked the first doctor he could find, and killed an 'innocent' medical practitioner who had nothing to do with his care. Chris Beam tells the story well and uses it to give some background on the health system in China and why so many patients and their families turn violent when they are treated so badly. However, I found the article was a bit too focused on the legal side of things (the American obsession with law once again?) The article doesn't really explore the root causes of violence: the built-in pressure in the system to overprescribe and over service, the rising cost of treatment and the hugely overloaded hospital system. Beam does cover China's health reforms, but strangely fails to mention the recent moves to encourage private clinics and the use of primary care clinics. Another factor not really touched on by the New Yorker article is the patient/family faults: for me some of the key factors in China's medical disputes are rising expectations combined with ignorance (poor health literacy) and readiness to use brute force. This is not just confined to health: see how Chinese travellers behave when flights are cancelled or hotel rooms are overbooked. That's why I prefer the BMJ Open article by Dr Jiang Yishi and colleagues at the School of Public Health, Fudan University, Shanghai. Their article takes a look at the reality of the complaints systems that exist in Chinese hospitals - and finds them sadly wanting. Dr Jiang and colleagues undertook the first in-depth study of how the complaints system works for patients and for doctors and hospital staff. They conducted interviews with all 'stakeholders' and found that in many cases, the system is broken. In theory, a patient with a grievance has several channels through which they can seek redress. They can make a formal complaint to the hospital complaints office and can also petition via a system of 'letters and visits'. Patients can also go to mediation by a third party office to settle an unresolved dispute with a hospitals. And patients can also take legal action against a hospital via a lawsuit. In practice, these systems often do not work. Firstly, many patients are simply unaware of the complaints system and how to use it. Hospitals don't advertise their complaints offices, which are often hidden away in an obscure corner of the building. The staff in these offices are supposed to be able to investigate complaints and arrange mediation - but in practice they are often unqualified to adjudicate on complicated clinical matters, and they are also under great pressure to deflect complaints - or dismiss them quickly. Complaints departments are understaffed and have little sway in the hospital system. Another problem with the 'complaints office' system is that it lacks transparency. Patients make complaints but they get little feedback from complaints office staff who do everything 'behind closed doors'. On the other hand, hospitals and medical staff also express great frustration about the complaints system. Doctors say any complaints arise because they work under great pressure to see 60 or more patients in a morning and don't have time to put on a 'warm face' or to explain things in detail to patients. This lack of connection and communication leads to many misunderstandings and unhappy patients. Doctors also say that they become the scapegoat for failings of the system: for example, (just as in the US) they are restricted in what treatments they can offer to patients by the medical insurance rules - but patients don't understand this and often get angry at being denied treatments are given treatments that come with a hefty out of pocket costs. Another big frustration for doctors and hospitals is the rise in unreasonable complaints and the use of abuse and pressure (extortion) to get a complaint resolved with financial compensation. More than 50 doctors interviewed mentioned this 'chao' (吵, argue) phenomenon. Doctors said many patients and relatives had unrealistic expectations about what could be done by medical staff. And when things didn't have a good outcome, patients and relatives often turned to threats and 'mob tactics' to put pressure on doctors and hospitals. These unruly groups are not interested in facts or a fair settlement but want to cause as much trouble as is needed to get a financial payout. The BMJ Open article says the whole health complaints system in China is lacking in structure and rigour: there are no standard protocols for investigating complaints, for assessing harm and no data is collected on complaint numbers or how they are followed up - and no system for using complaints to identify weaknesses or errors and give feedback accordingly. Hospitals have no incentive to collect or document complaints because it just gives them more 'black marks'. The overall impression of the health complaints system is that it is perfunctory and ineffective: hospital directors want complaints to be managed quickly and made to 'go away', hence the readiness to make a quick financial settlement and avoid trouble and bad publicity, especially when angry mobs are involved. The article by Jiang concludes by identifying three crucial areas where improvement is needed in the complaints system: organisational support, personal support from hospital managers and political leaders (and patients) - and learning system to ensure that failures are identified and rectified. The solutions put forward are sensible and obvious - and the full paper is well worth a read. However, I would not be optimistic about the prospects for change: many of the problems that plague the health complaints system are common to those of Chinese society in general: there is a lack of trust in institutions (in this case hospitals and health departments) which are not accountable, lack transparency and which combine vested financial interest with political power. The solutions require open-ness, accountability and an independent watchdog with teeth. In the current environment in China, those are not likely to happen. Instead, China has top-down directives to crack down on the symptoms of these failings - the government issues stern warnings and makes some highly public arrests of wrongdoers. Ultimately it will take workable systems to fix the problems of health grievances, not campaigns and punishments.